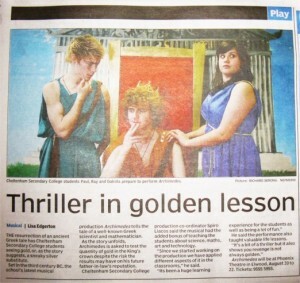 The resurrection of an ancient Greek tale has Cheltenham Secondary College students seeing gold, or, as the story suggests, a sneaky silver substitute. Set in the third century BC, the school’s latest musical production Archimedes tells the tale of a well-known Greek scientist and mathematician. As the story unfold, Archimedes is asked to test the quantity of gold in the King’s crown despite the risk the results may have on his future father-in-law’s reputation. Cheltenham Secondary College production co-ordinator Spiro Liacos said the musical had the added bonus of teaching the students about science, maths, art and technology. “Since we started working on the production we have applied different aspects of it in the classrooms,” he said. He said the performance also taught valuable life lessons. Archimedes will be at Phoenix Theatre in Elwood, August 20 to 22.